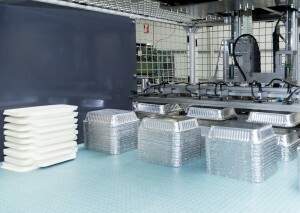 A long history of knowledge and experience in aluminium tray production has enabled Danpak to become a market leader in packaging materials for the baking, salads, vegetables and meet industry. To keep products fresh, firm and crusty, we are continuously researching packaging materials. Only the best-quality materials are good enough for our end products. With its extremely flexible production method, Danpak stands out from its competitors. The modular design of our production lines means that if one of our machines breaks down, the production of your order can easily be resumed by one of our other production lines. Because the moulds for your end product can be used by several of our machines, you can always be sure of a speedy delivery. The presentation of your product is crucial. Danpak containers present your product to the end user in the most attractive way possible. We develop trays in every imaginable shape and size. Cornered or rounded, polished or embossed. Our wide selection also includes seasonal products such as barbecue meat trays in various designs.